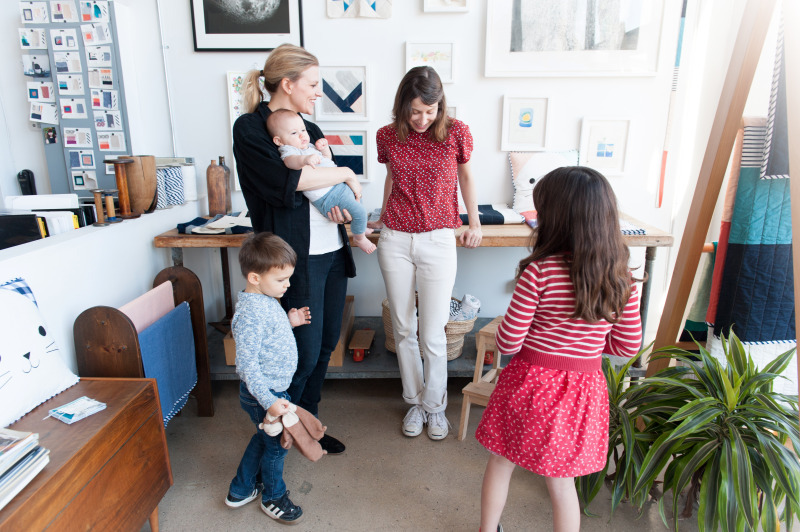 Think working mothers can have it all (at once)? 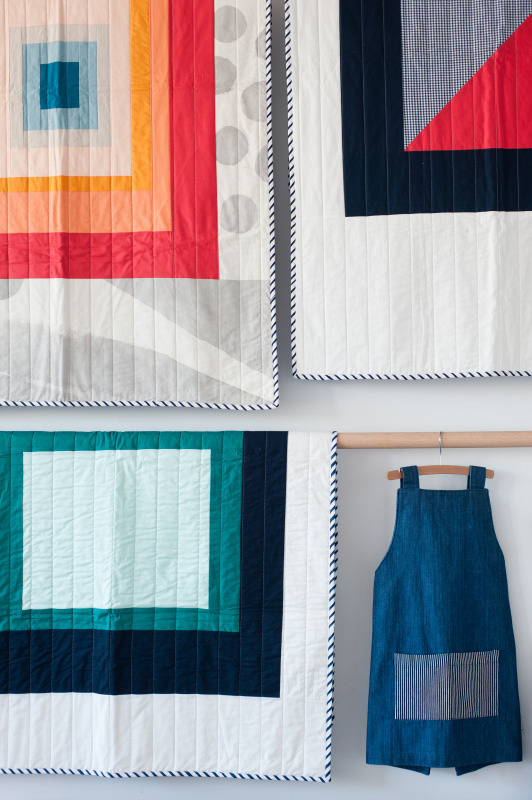 Eliza Kenan and Claire Oswalt of the modern, cult-followed quilt line Hopewell, think not. Which is just one of the reasons the Hollywood-based creatives and friends decided to suddenly close shop on their bustling business. 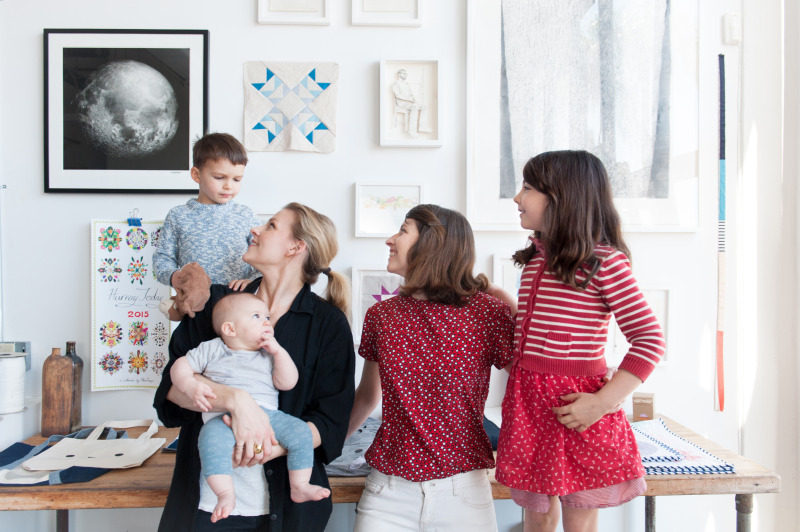 Here, the mothers (Eliza has 7-year-old Una Mae, Claire has a 3-year-old son Ozzie and 5-month-old Hagen) invite us into their darling studio—kids in tow—to talk candidly about juggling work both inside and outside the home. 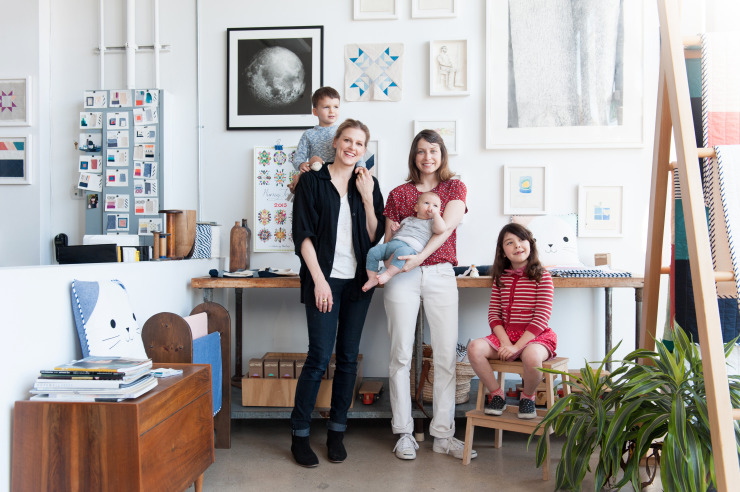 Meet the Hopewell gang—Claire Oswalt and her sons Ozzie (standing) and Hagen, and Eliza Kenan and her daughter Una Mae. Claire: "I was making art." Claire: "We launched summer of 2013, but had already been working together for a few months. I had just had a child, and felt depleted of all creativity. I was itching to start something new, preferably outside of the art world, so I called up the most creative person I knew. We were both on board for a new venture, but we just weren’t sure what it was. 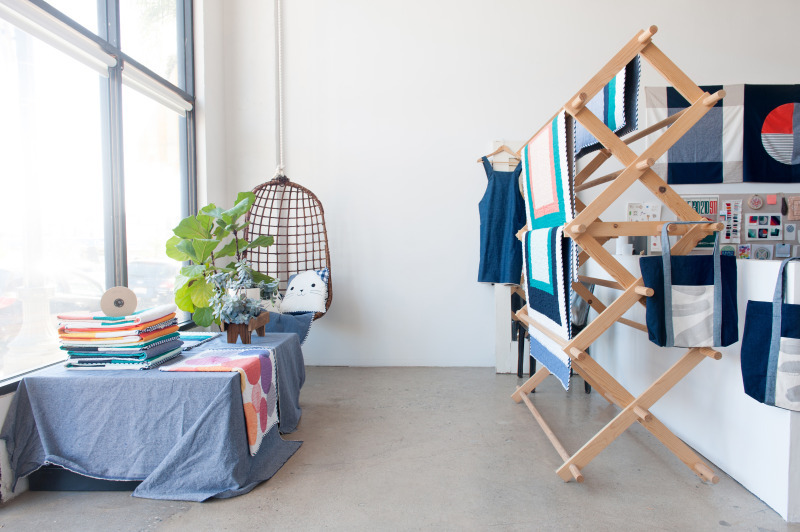 I think at one point I suggested a movable monthly pop-up shop where we sold anything and everything we could make within one month. 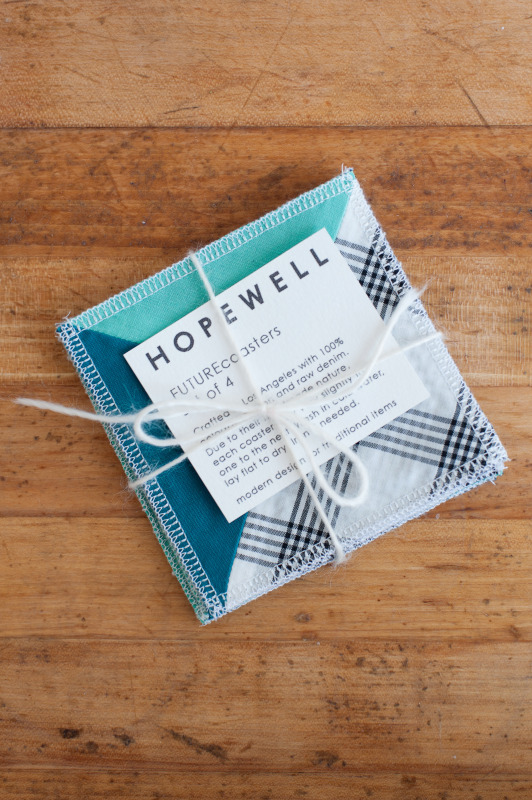 So, within that indecision and exploration we collaborated on 12 one-of-a-kind quilts, and thus began Hopewell." Eliza: "Yes and no. 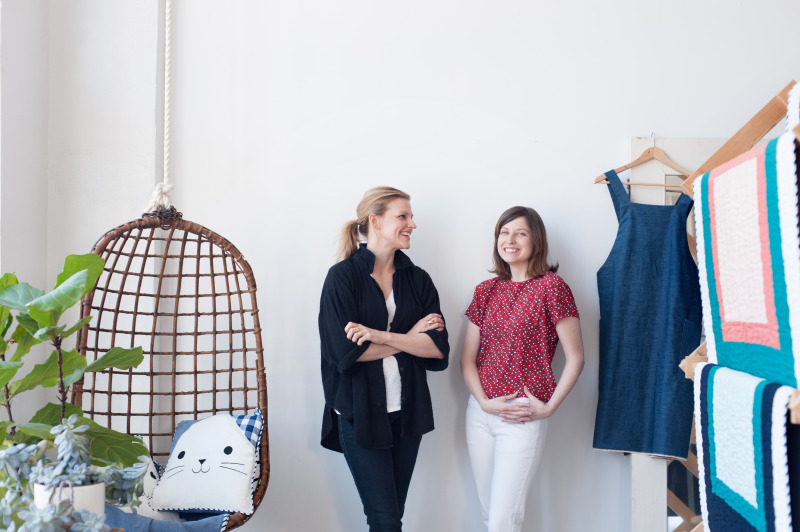 I don't think we would have started the business if we didn't think it could be successful, but I don't think we ever considered that the success of the business would have such a big effect on our lifestyle." Claire: "I think Eliza said it best. Our goals were lofty to begin with. I just don’t think we fully understood the sacrifices that co-exist with lofty goals." 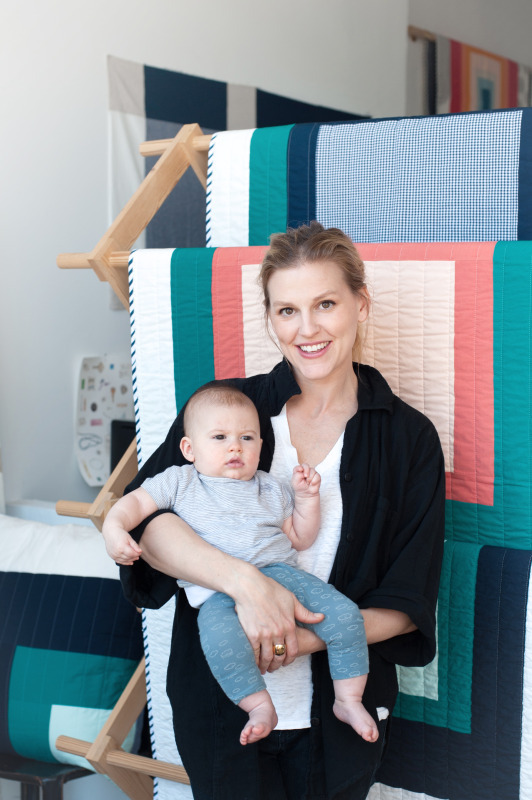 Eliza: "Sunset Magazine devoted a full page to one of our first quilts about two months after we launched our website and that quilt sold out within 48 hours. It taught us the power of press and the risk of losing all of your inventory, which is both good and bad." Eliza: "It's a hard question to answer. We came to a point where Hopewell was ready to take off, but it would have meant some significant sacrifices in our quality of life. I've been pretty steadfast about only working while my daughter is in school, so 9 a.m. to 3 p.m. I only have the one kid, so this is it for both of us. For me those after-school hours are important—she reads, we work side by side, we get bored together, we cook dinner, we dance in the kitchen, sometimes it takes hours of this before she'll tell me everything that's going on in school. These unstructured hours are teaching her to be self-motivated and how to deal productively with boredom and co-existence. She's very independent and even though she is only in first grade I can already see the day she's leaving for college in the not-so-distant future. Work was great, but family is greater." 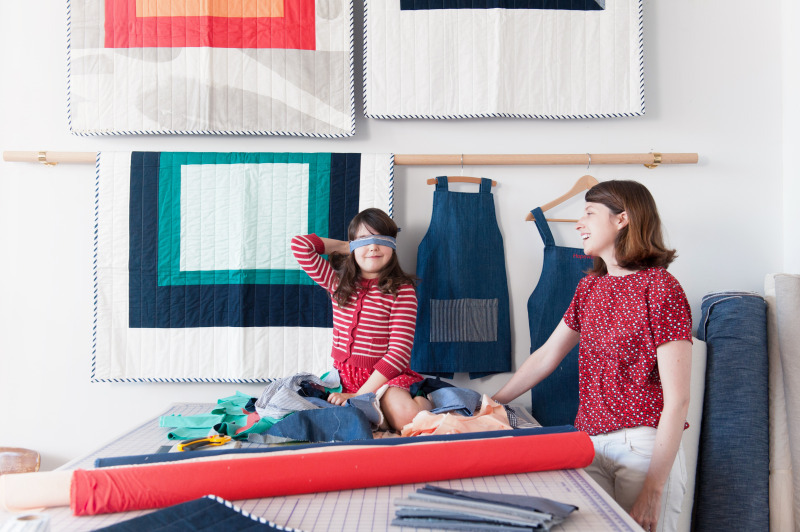 Claire: "This could be written in a 10-page essay format, but I will simplify by saying that despite loving Hopewell, the products we made, and the collaborative process, Eliza and I opted to spend our days less regimented with the option to stay home with a sick child, plan a birthday party, pick up and move cities, or explore an artistic whim. We philosophized for hours on end on this one life we’re given and how we want to live it. We proposed various ways of working to see if we could do it all, and for us, the answer was 'no.' 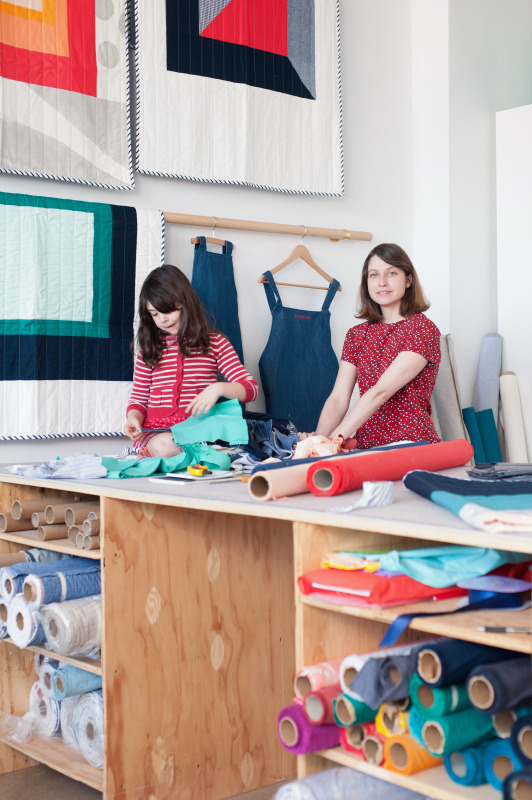 I have so much admiration for the women who raise children and run a business. It’s a lot of moving parts. 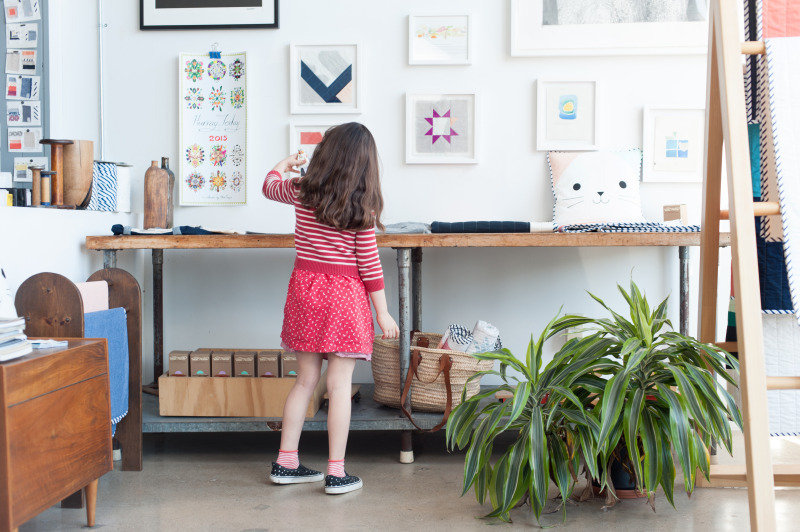 Perhaps one day we will be able to return to an office, but for now, we choose to focus on our families without the feeling of letting down a business partner." 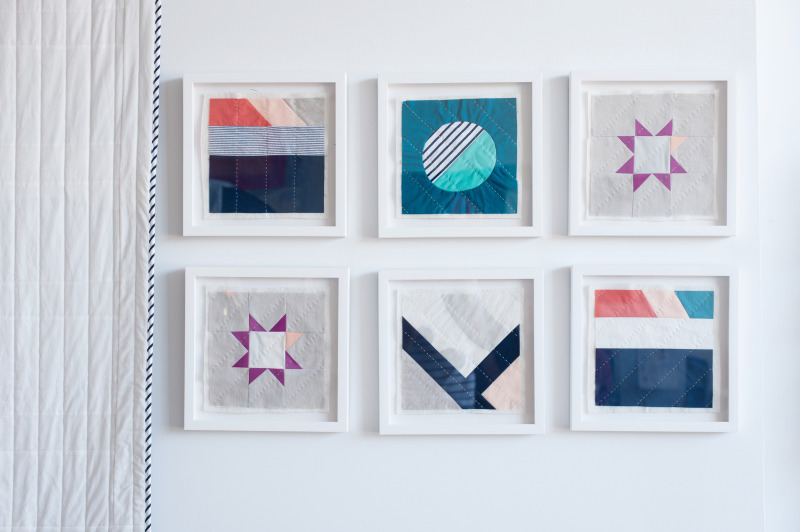 Claire: "A myriad of new skills both creative and technical. It was like going back to school. I like that type of accelerated learning. It’s not often you get to experience it in your thirties, outside of an academic setting." Eliza: "That Los Angeles is a great place to start a business, starting a business with a friend can sometimes be a good thing, and closing the business is sad, but ultimately everything is going to be OK."
Eliza: "The studio space is in Hollywood. 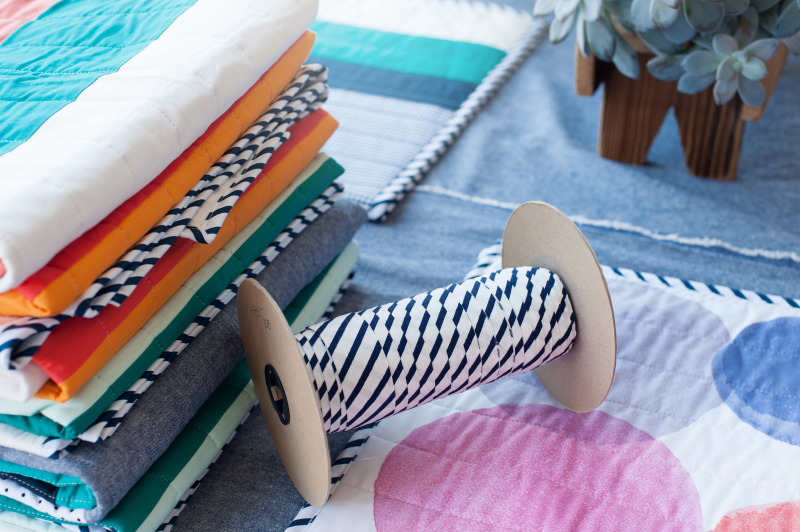 The aesthetic is like our quilts—pragmatic, clean, colorful, warm, but with some hard edges, too. I'll be keeping the studio to work on my next project, so it will be interesting to see how it changes (probably messier)!" Claire: "I am not sure my 3-year-old Ozzie has any idea what it is I do. It’s not fair to put labels on him this early, but I am detecting a very literal side to him. 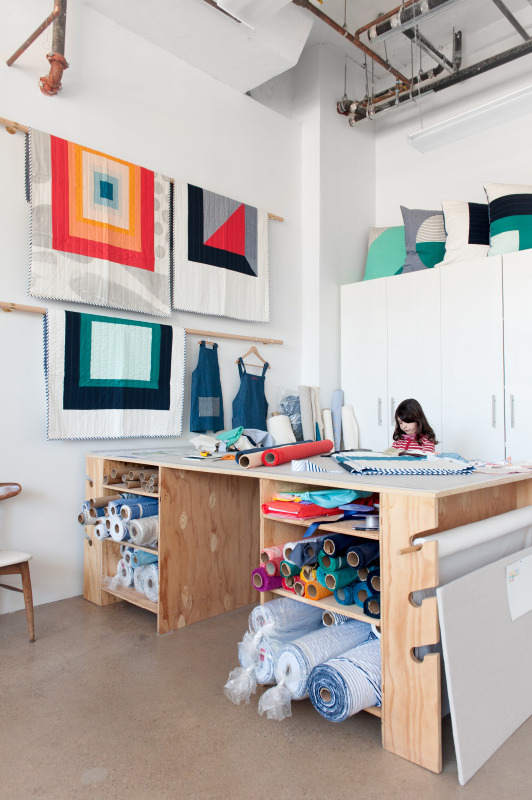 The studio seems challenging with its bold shapes, bright colors, and unnecessary stacks of fabric. I like bringing him in there, but he is a very boyish boy, so it’s not like he is begging me to take him to the studio. 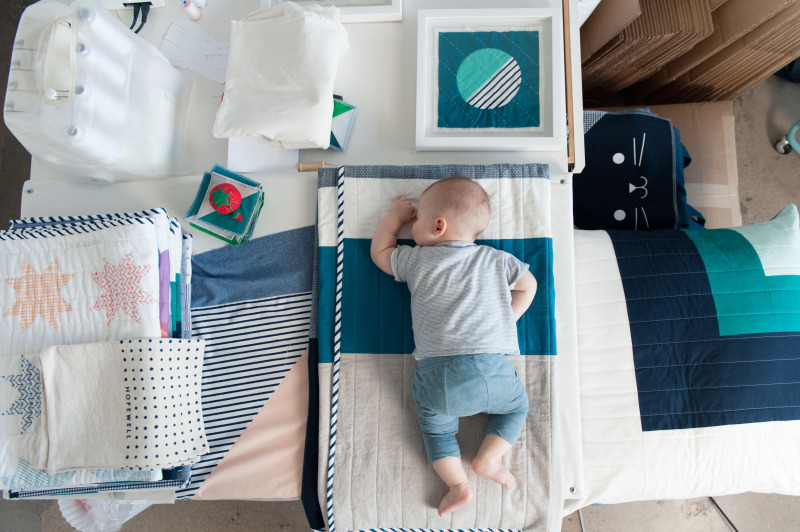 Hagen, the 5-month-old, just falls asleep on the quilts." 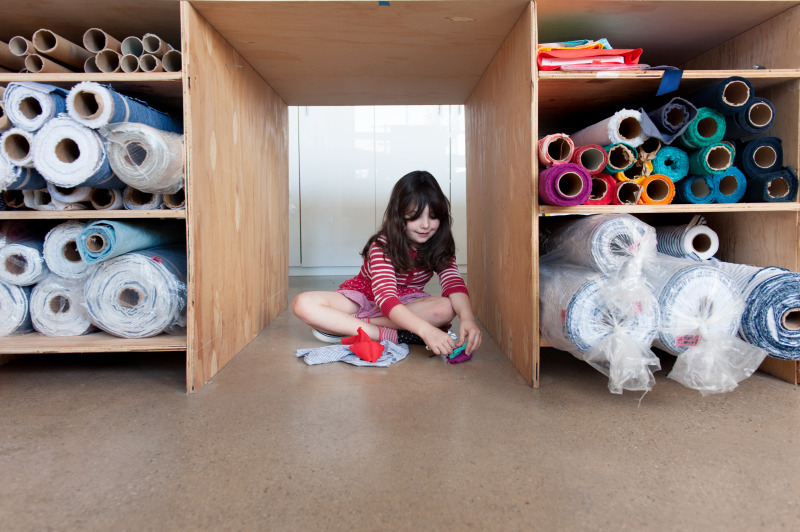 Eliza: "My daughter likes the scrap fabric bin and the snacks, but mostly she heads straight for our neighbor Sonia Boyajian's studio next door where she makes jewelry out of wire and rhinestones." 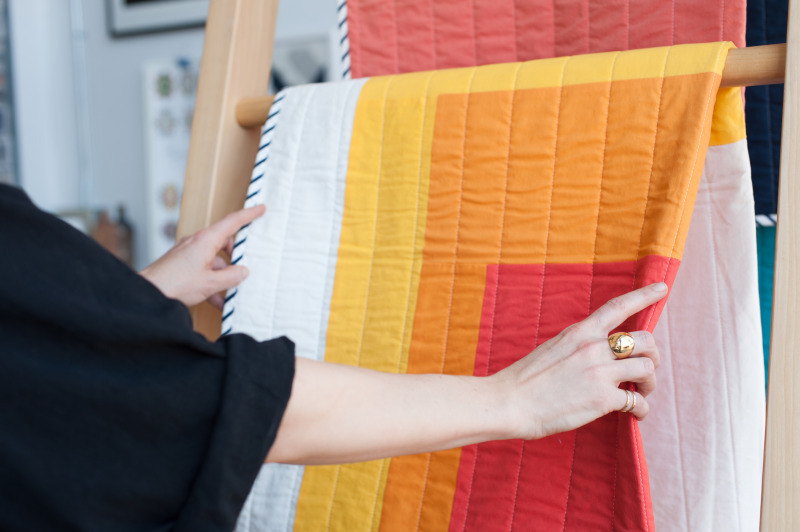 Eliza: "I'll be working on some larger commissioned quilts and some other art-textile pieces." Claire: "I am going back to painting and art. I am presently working on some commissioned projects for Commune Design, all the while getting excited about scaling up my watercolor collages. 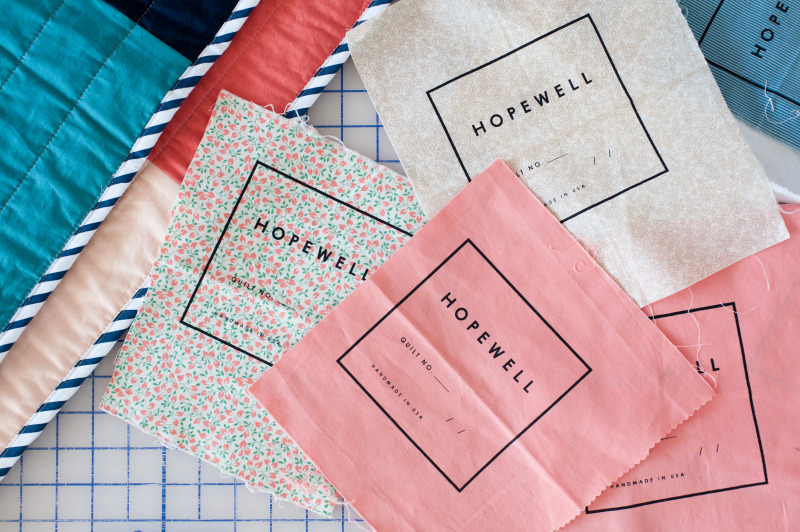 Hopewell taught me a whole new way of seeing and whole new way of working. I’m interested to apply it to my personal work." 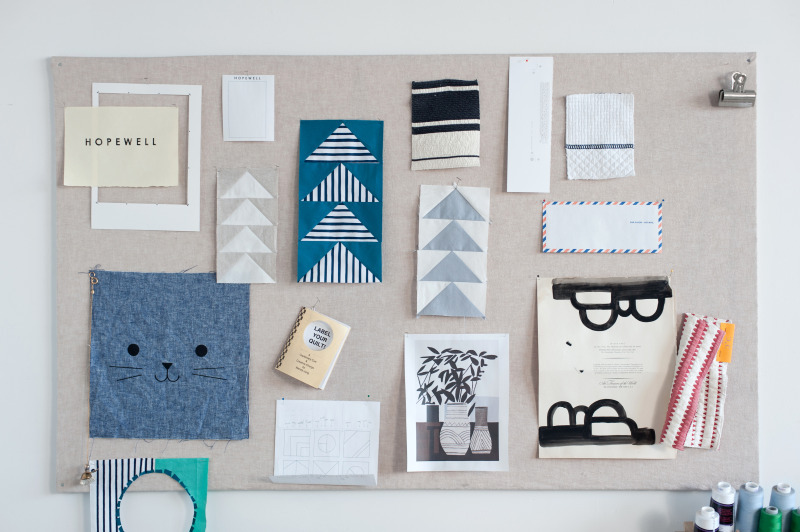 Something like our dream office. 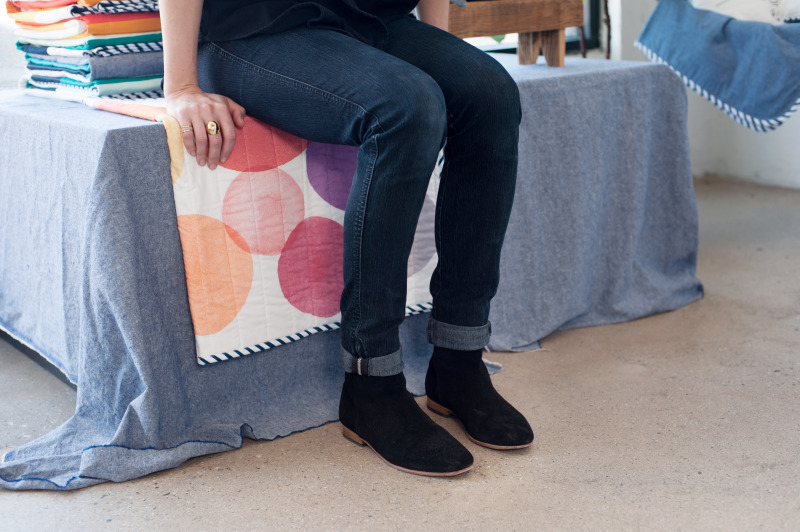 Claire: "Quite literally, the creative process has changed for me. I no longer have the time I once had to create, so no longer do I make near-photorealistic drawings. 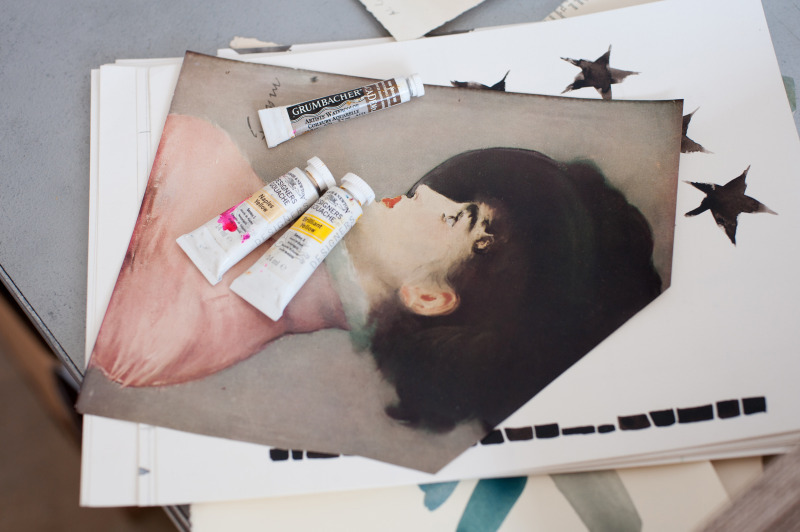 No longer can I hang onto every brushstroke, or mark. I just have to let it go, move forward. I didn’t know it, but I think it was exactly what I needed to progress in my work." Eliza: "Before I was a mother my job was everything. I worked long hours far from home and now I can't imagine being an art director for film again for at least a few more years." Claire: "Oh, hell yeah. This is probably the toughest and most emotion-evoking question for me to answer. 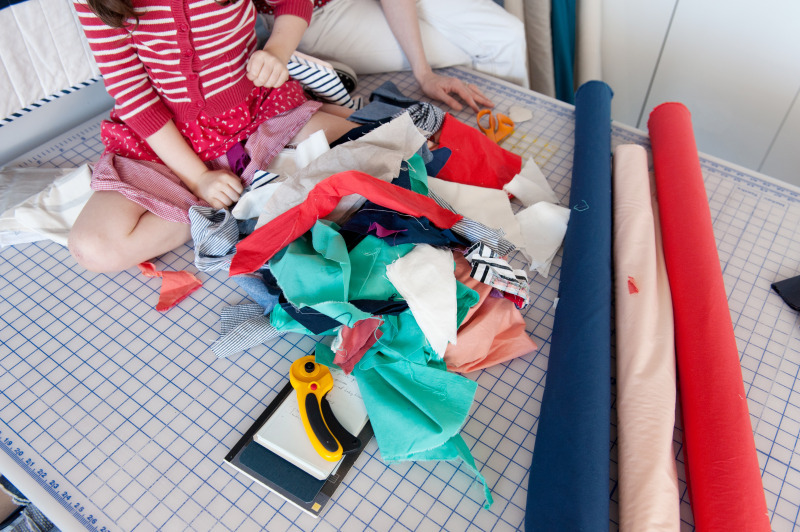 Working while mothering children is an amateur circus act of spinning plates. I always have an eye on every plate, making it impossible to truly watch and enjoy the beauty of just one plate spinning. The feeling of being 'stretched thin' is constant. But the best part about my new circus act is that I no longer do it for the attention of the larger audience, but really for just those two children sitting up front." 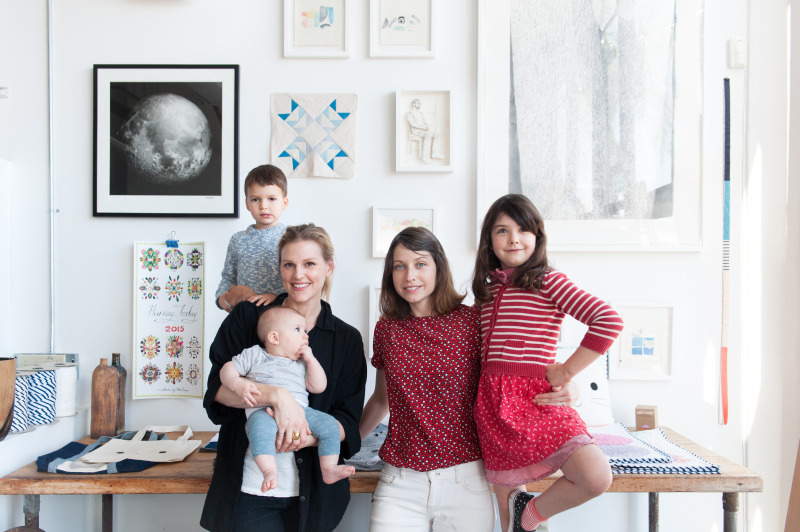 Eliza: "I prioritize motherhood, possibly at the expense of my career. I'm allowing myself the space to change my mind in a few months or years, but for right now it feels good. I still need to pay the studio rent every month, but I'd rather skip a new pair of shoes to spend more time with my family." Claire: "I no longer read books, nor newspapers. I have to ask my husband for a weekly synopsis. Nine o’clock seems like a reasonable bedtime and a manicure seems like a night at the opera. And a text to my husband saying 'Baby’s asleep, meet me in the bedroom' is romantic." Eliza: "That I really need to schedule the time I have to myself. I try to be very present when I'm with my daughter and it can be exhausting, but I really don't want her to see me looking at screens all day long. 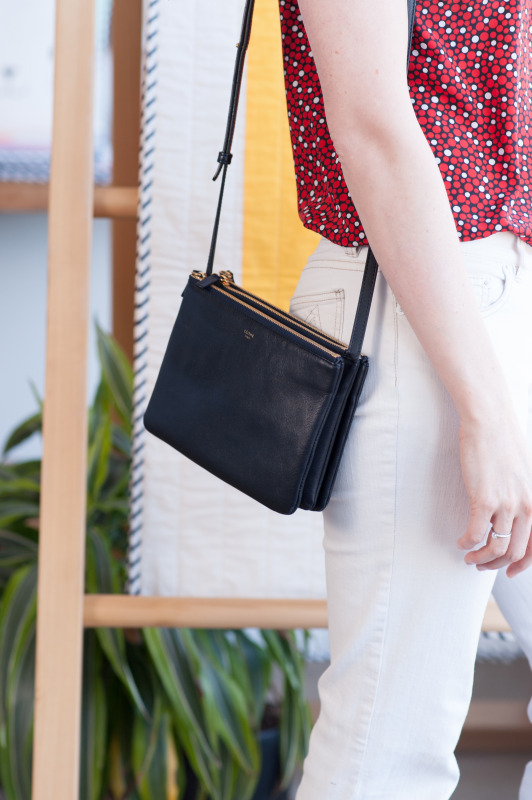 I didn't understand how 'full-time' motherhood would be and that I'm always going to be a role model for her, so I need to practice what I preach. On the flip side, I get to experience falling in love again. I get to relive my own childhood through unexpected, spontaneous recollections. I cry more readily (which is a good thing, in my opinion)." Eliza: "That motherhood and fatherhood are not equal. I really thought my husband and I would co-parent, but life just doesn't work that way. Nursing is just the beginning of the inequity, but once I stopped keeping score and let mother nature take charge, things got easier. That first year is just brutal!" Claire: "The structural changes in my body. I felt like a skeleton that had been disassembled then put together again—and the new version was just slightly 'off.'" Claire: "Simply, watching my two boys grow up. I am so curious as to who they are, what they will achieve, what they will struggle with. 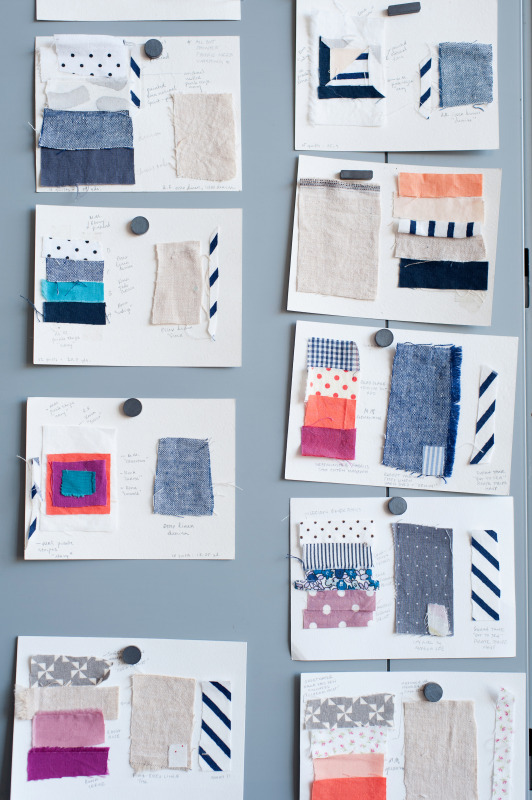 It is a truly awe-inspiring process." Eliza: "I get to watch this amazing little human, that I helped create, grow up in to an amazing adult! It's really pretty amazing when they start reading and forming their own opinions about the world. And I have a front row seat...whether she likes it or not!" Eliza: "The teenage years seem so far, but I know they are just around the corner." Claire: "Don’t let the sleep deprivation scare you. 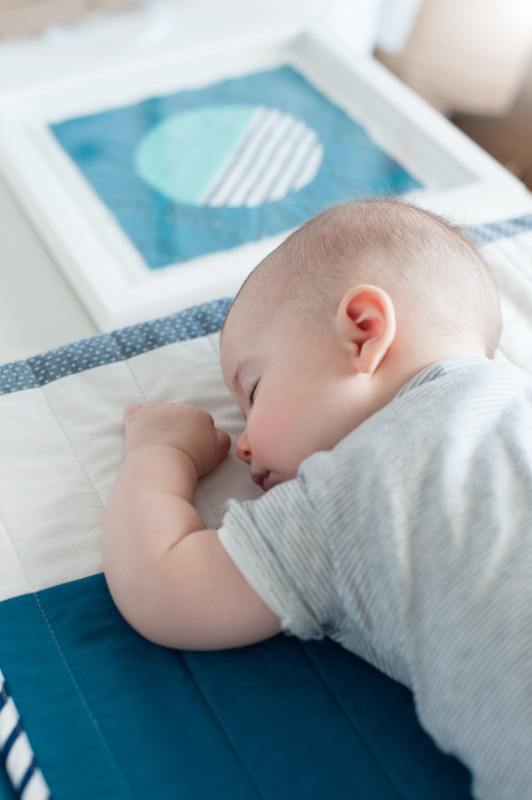 Eight-hour nights eventually come back to you, but spending those silent, dark hours with a newborn don’t. Eliza: "You can't be 100% certain about the name until you meet her. She might not be the name you thought she was. Be flexible." Eliza: "My favorite days with Una are usually when we are traveling. I kind of love not having cell phone service, so we have to use maps and probably get lost, maybe take a bus, definitely eat ice cream. It's a little stressful, the kind of stressful that makes for a better story in retrospect—like her skinning her knee and me having to find a Band-Aid in a neighborhood that's not really for tourists, but we find one and we meet people we never would have met otherwise and we have a second ice cream because we are on vacation and we can do whatever we want. And we still have some of those Band-Aids and they remind us that we are capable of great adventures even if those adventures come from making mistakes." Claire: "The little guy requires us to stay home a lot, so currently an ideal day involves a morning of everyone in bed together, even the dog. 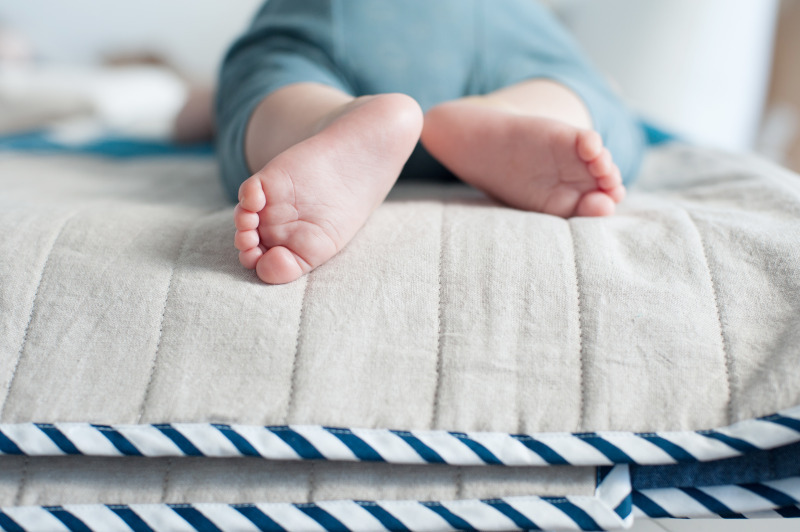 It’s just a mess of little feet and paws and pillows." 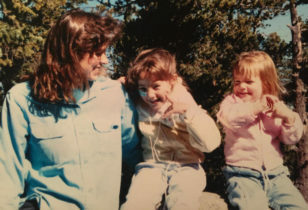 Claire: "I pull what I can from the moms around me, and from my own memories of growing up with a great mom. I think it’s important not to be dogmatic in your mothering. What works for one may not work for another." Eliza: "I look at the women around me. 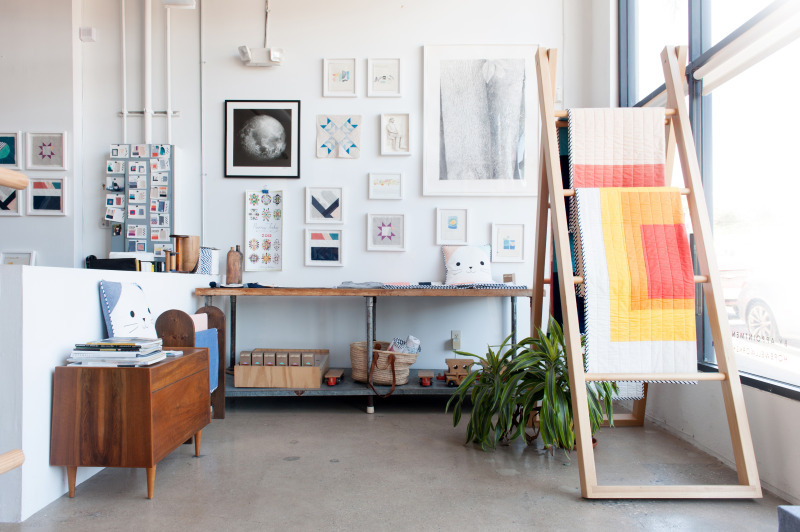 Mostly artists juggling the big three—creative fulfillment, financial stability, and time with family. Everyone handles it differently and I'm not sure there is one correct way, but we are figuring out together." Claire: "Sadly, as I already mentioned, I don’t have time! And when I do come across a spread or book depicting a glowing mother with brushed hair sitting on stain-free chaise lounge holding a porcelain bowl full of homemade snacks, it makes me giggle. 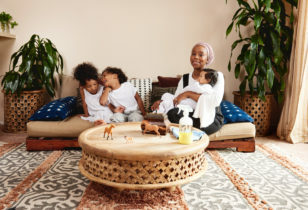 I am happy for them if they can truly pull that off all at once, but my version of motherhood is a bit messier—and I’ve got to be okay with that because I’m doing the best I can." Eliza: "My daughter can't really avoid it! My husband and I are both artists and we both work at home whenever we can. She gets to see the entire process of making a film and understands that most great creative endeavors take months, if not years, to complete. She has her own sewing machine and if she wants a new dress for her doll she knows that we don't just buy it at the store. 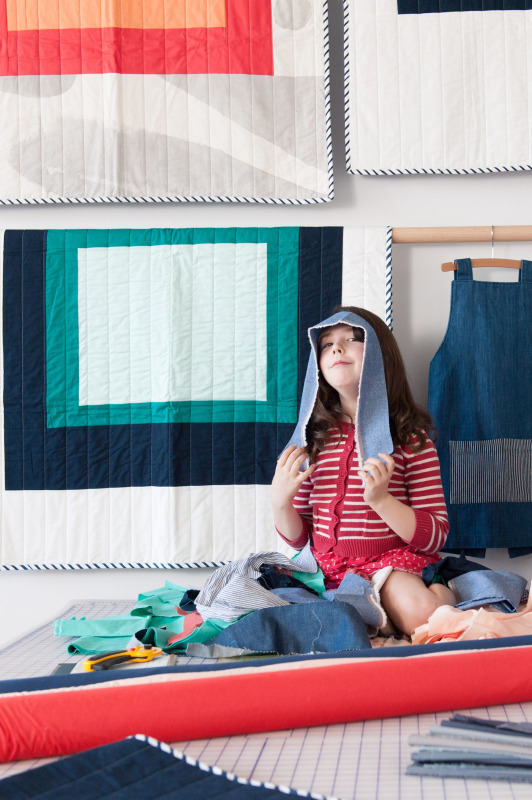 It really changes the idea of 'needing' something when you understand the process that goes into making it yourself." Eliza: "I grew up mostly in New Jersey and a little New York City." Claire: "I’m a seventh-generation Texan. I felt obligated to have one of my children (Ozzie) in Texas, so as not to break the legacy. I know, sounds crazy." Claire: "At a picnic in Central Park in 2001 with a bunch of mutual friends. Eliza was wearing a striped shirt with a peter pan collar. Her style has remained consistent to say the least." Claire: "Hearing the coyotes howl at night and watching a hummingbird hatch her babies in the same tree every year, all the while knowing that you can be at the Arclight or the Hollywood Bowl in minutes, watching a completely different type of spectacle." Eliza: "I love that LA is a big city, but we can walk out our front door and be in Griffith Park in five minutes. There's a creative energy that swirls around the movie industry that I think is just incredible for my daughter to grow up around. We are surrounded by so many dreamers and creative people." Eliza: "I miss the types of woods and creeks we had on the East Coast. Because of my husband's career as a filmmaker we get to travel, but it's always nice to come home to an LA winter." Claire: "Sure. We’re always open to moving. Whatever is best for the boys." Claire: "Barnsdall Park for the green space and Little Tokyo for the bowling with bumpers. During the summer, we go to a beach in Malibu almost every weekend." Eliza: "Griffith Park for hikes, the LACMA (free admission when you bring a kid! 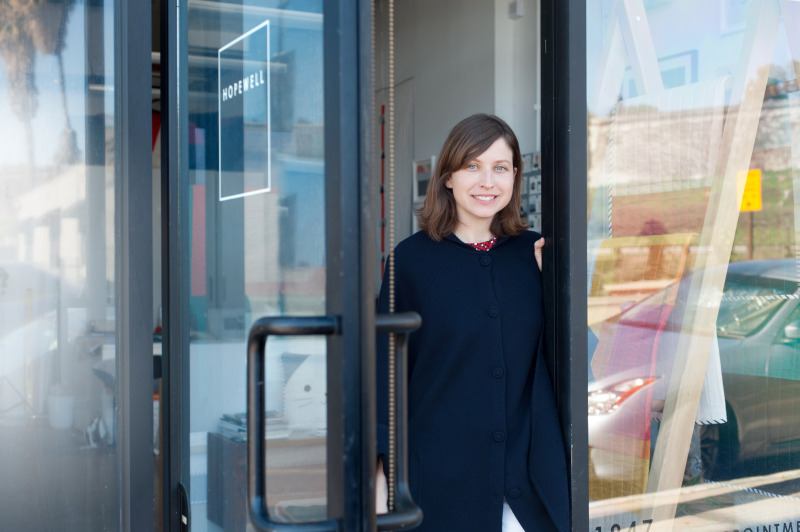 ), Little Tokyo, and the MOCA, Barnsdall Park, and the beach."